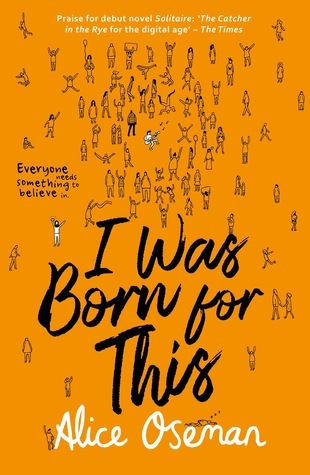 When I participated in Liza’s TBR Jar Readathon, the second book I pulled out of my jar was I Was Born For This. It had been on my TBR for quite a while since the author is coming to YALC and it was one of the books that caught my interest immediately. I finally got to read it – and in time for YALC at that! Let’s ignore how this review is posted way after YALC, shall we? When I start a review, I always ask myself what the first thing is that comes to mind when I think of a certain book. With I Was Born For This, it’s definitely the writing. Apart from the switching POV’s between Angel and Jimmy, it’s also written in a way that reads so fluently. I read the book in no time! Being a fan has made me better friends online than I’ve ever encountered in real life; it has entered me into a community where people are joined in love and passion and hope and joy and escape. As for the point of views, I adored how we get both sides of a fandom. We get Angel, who’s a big part of the fandom, who’s in deep and who worships The Ark and its members. Then we have Jimmy, the main member of The Ark who’s living the big life, having to cope with all the media, fans and pressure fame brings. Seeing both sides of the spectrum was something I really enjoyed because it proves how not everything is the way it appears to be – on the contrary. It made for an interesting story. Not to mention you keep wondering how Angel’s and Jimmy’s lives are going to intertwine, in what way they’re going to and what’s going to happen between them. Especially that kept me completely invested because I didn’t want it to be another predictable love story. Simply having me consumed like that, is definitely why this belongs with the good points! Whether or not it’s the love story I expected is something you’ll have to find out by yourselves! Fame, pressure and fandoms are only a few of the things Oseman mentioned in this novel. There’s also belief – Jimmy having God, Angel believing in Allah -, anxiety, alcoholism and the overall theme of friendship in different ways. And that’s not even mentioning the diversity of our characters apart from their belief! Jimmy’s transgender, Rowan’s parents are Nigerian and Lister had a rough childhood. So you can definitely say diversity is present in a lotlotlot of ways. I sometimes had trouble connecting with Angel / Fereshteh because she truly felt – and actually is – totally consumed by The Ark and the entire fandom surrounding it. I often found myself wondering how someone can only have that one thing to focus on and love – neglecting everything else. Not even seeing when things are happening with the people around you because you.. simply are in way too deep in the fandom. I struggled with it – that’s for sure. One minor thing I also struggled with – but is more personal – is how the alcoholism was overly clear, mentioned a couple of times but never really dealt with. I wish that had happened because it’s something important to me. I would’ve loved seeing that handled in some small way at least but it wasn’t. Should the alcoholism-part be different, I’m sure I would’ve given it at least four and a half cupcakes, maybe even five. All in all I really, really loved this story! What are the reasons you love being part of the book community? Or a specific fandom? What does it give you that real life doesn’t? Or doesn’t enough? There’s just so much stuff going on that i can’t seem to single out one thing. Great review! This book does sound interesting; I have enjoyed a few books that revolve around fandoms this year, so this one might make my TBR for later this year. It depends on other books I manage to get my hands on. KATHY I am so happy you enjoyed this book so much, despite the minor issues you had with it overall. I loved it so much and Alice writes the most amazing books ❤ I hope you'll read more from her at some point 😀 Lovely review! I agree, only having the character focused on the fandom at the expense of everything else makes it a bit difficult to connect with her. A pet peeve of mine is when an author introduces something very serious and then brushes it away, so I would feel similarly about the alcoholism aspect. But I’m glad to hear you still enjoyed it! Great review!